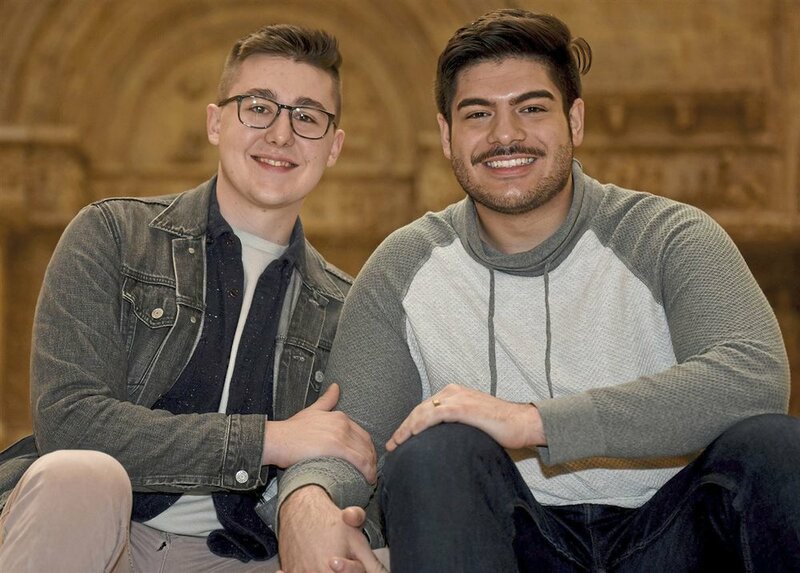 Louis Spanos and Colten Gill first met their senior year of high school, ended up attending Point Park University together, and now spend their time living and working in Pittsburgh. 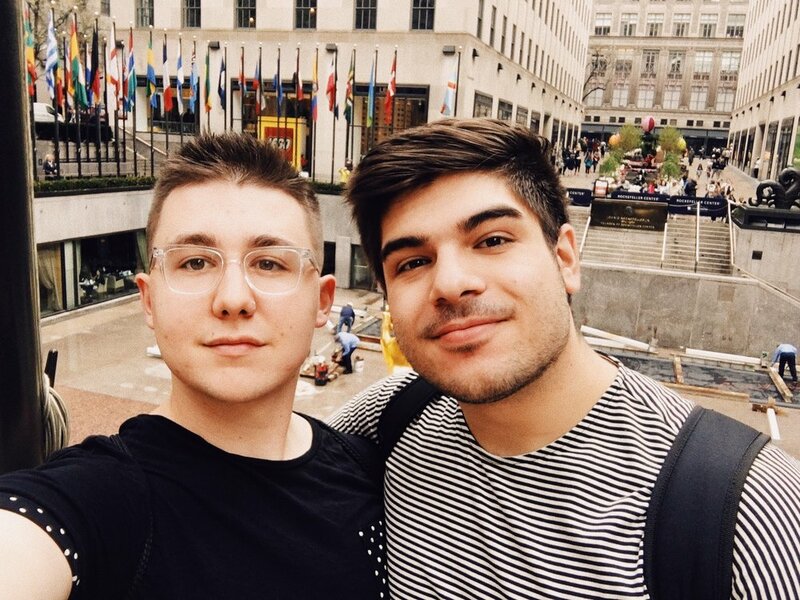 Their senior year of college, the two took a Spring Break trip to New York City, where, after four years together, Colten proposed on the top of 30 Rockefeller Plaza, overlooking Central Park. Ready to wed, Louis entered the pair in a Facebook contest one afternoon. The prize? Celebrating their wedding in one of their favorite Pittsburgh locations - the Carnegie - with all of the city at Third Thursday: We Do. With the support of their incredible family and friends, Louis and Colten got the wedding of their dreams and cannot wait to celebrate with you. While it’s a little unusual (hello, it’s a public event where anyone + everyone is invited), it’s perfectly Louis + Colten. Enjoy tours of the museum’s collection, a photo booth, DIY crafts, a dance party, and wedding cake for all. The ceremony will be standing room only - get there early to get a spot near the front. Share your pictures with us! Use #louisandcolten on social media. Due to the nature of the event, dinner will not be served. While snacks will be available to purchase and wedding cake will be available for all, we recommend eating before hand. View a list of Louis and Colten’s favorite ‘burgh bites below. Cash bars will be available throughout the venue. Anyone and everyone is welcome to attend! This is a public event, although you must be 18 years or older. Invite your group of friends, enjoy the museum’s activities after-hours, and eat some cake. We’re looking forward to celebrating with yinz. While we greatly appreciate them, as this is a public event, please refrain from bringing gifts to the ceremony, as there simply isn’t a proper place to receive/store them. Cards may be dropped off at the ticketing tables when you arrive. This is a ticketed event. Tickets will be available at the door, but are available for $10 (instead of $15) here. After purchasing your tickets, be sure to let us know you’re coming (along with leaving your address so we can thank you). The Carnegie Museum of Art is one of Louis and Colten’s favorite places in Pittsburgh. As part of the event, you’ll get to tour the museum’s collection, which includes the 2018 Carnegie International. Parking for the Carnegie Museum of Art is most easily accomplished through the attached lot. View information on parking here. We rescued Jax, a 6-year-old pit bull terrier, in May of this year, and we love the work that Humane Animal Rescue does to support animals across the Pittsburgh region. We would be thrilled to have a gift from you be a donation to support their work in our names. Learn more about Humane Animal Rescue or make a donation here. Although wedding cake will be provided (and snacks will be available to purchase at the bars during the event), we recommend eating prior to attending. Below, find some of Louis and Colten’s favorite eats around the ‘burgh. Louis and Colten have been overwhelmed with interest and support for our (unusual) wedding. Read about some of the features below. Press inquiries: Contact the couple below, or reach out to the museum here. Third Thursday: We Do will see Colten Gill and Louis Spanos joined in matrimony, and the museum is selling tickets. The couple, high school sweethearts who live in Dormont, has been engaged for a while and had a smaller wedding in mind; they just knew they wanted something cold-weather friendly that would be special for their families. But their plans ramped up when they entered, and then won, the contest. “It’s such a dream come true to invite the whole city to celebrate what I see in Louis and in the two of us,” Gill said. And yes, they really do extend the invitation to everyone… “It’s sanctioned wedding crashing,” the groom-to-be said. 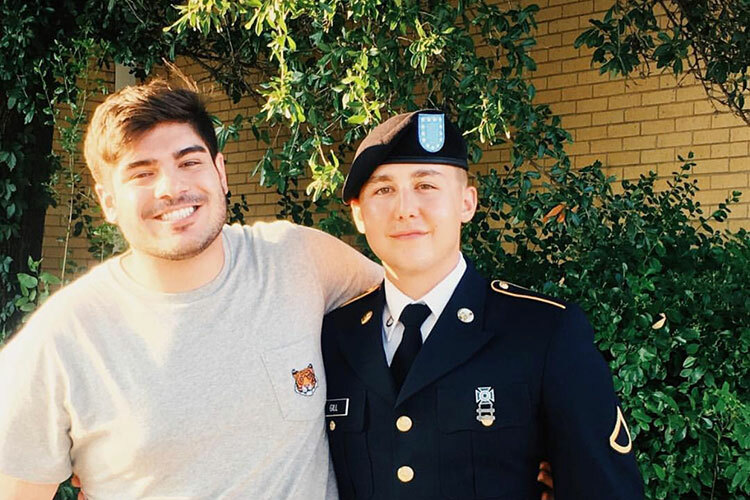 “The committee enjoyed Louis’ and Colten’s story of being high school sweethearts whose bond flourished after Colten joined the military,” said Ms. McDermit. The high school sweethearts learned Feb. 1 they were the winners. Our homepage photography is by Sandrachile.